CJ Thornton is a graduate of Deer Park High School, near Cincinnati, Ohio. She began her career in pupil transportation 37 years ago, the day after her 21st birthday at Princeton City Schools in Hamilton County. The person who trained her to be a school bus driver later became her mother in law. She served in various capacities at Princeton, route driver, special education route sub, On Board Instructor since 1986; Transportation Coordinator 2001- 2004 and Transportation Supervisor 2004-2010. She was chairperson for the SW Regional Roadeo from 1999-2004 and is currently serving on the State Roadeo Committee. 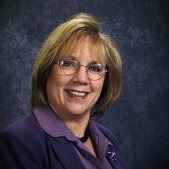 CJ served as the SW Regional Representative for OAPT 2005-07. In 2011 she left Princeton to become the Transportation Director at Mason City Schools in Warren County. She is a member of the National Association for Pupil Transportation, Ohio Association for School Business Officials, and a 2004 graduate of the OASBO Leadership Academy. She has been married to her husband Hal for 36 years; they are the proud parents of three children Rob, Heather and Daniel. Adam and Katherine call her Grammy and coming in the fall of 2013 a third grandchild will be welcomed to the family.